As we continue to remember the those affected by the Virginia Tech tragedy, Baylor University has paid tribute to the victims, the friends and family, and the entire Virginia Tech community. Flags flew half-staff until this past Monday and a moment of silence was held on the day set aside for rememberance. At the end of this moment, the hymn "Amazing Grace" was played from the carillon followed by 32 chimes. A moment of silence was given during the Brothers Under Christ (BYX) Island Party with Switchfoot--and the end of which "Amazing Grace" and the 32 chimes were again played. A Baylor University flag has also been signed by students and faculty and sent to Virginia Tech. Finally, and most beautifully, the Baylor University's Pat Neff Hall was illuminated in the colors of Virginia Tech University. 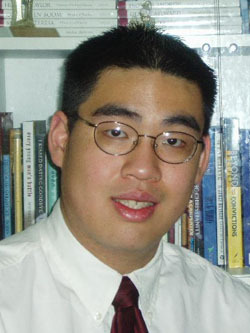 (See picture above). 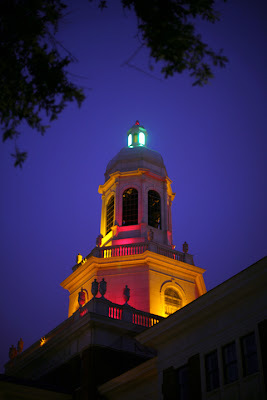 Pat Neff Hall, which is topped off with a 23-kart gold dome, is illuminated each night. On nights that Baylor wins in athletics the tower is illuminated with a green light. Baylor University is more than an institute of higher learning--we are a community and a family. On this occasion--the Baylor family reaches out to the Virginia Tech family. Each Baylor Bear is bleeding maroon and orange. We are all Hokies. John Marshall, a professor of internal medicine at the University of Missouri-Columbia made a case for the scientific acceptance of intelligent design and argued that scientists were trying to kick intelligent design "off the playing field of science." Many colleagues of Marshall are upset and have been criticizing him for his comments but some are supportive. As chemist and colleague Tim Spurgeon said, "I think that if we simply say that we're going to only look at what's in the box of only what can be natural, and yet there's this big white elephant in the room that no one's willing to touch … I think we're fooling ourselves." I'm writing you because you may (a) know students who would be interested, and could pass along this announcement, and/or (b) may be such a person yourself, and/or (c) may be a scholar interested in giving a paper at the weekend Conference, and/or (d) may be a scholar other intererested party who would like to attend the weekend Conference (all are welcome). Please look this over and either write back to me and Henry Teichert, Program Director of the ISN (on the cc line), or pass it along, as appropriate. We are strong enough to know when to cry and sad enough to know we must laugh again. We do not understand this tragedy. We know we did not deserve it but neither does a child in Africa dying of AIDS, but neither do the invisible children walking the night to avoid being captured by a rogue army. Neither does the baby elephant watching his community be devastated for ivory; neither does the Appalachian infant killed in the middle of the night in his crib in the home his father built with his own hands being run over by a boulder because the land was destabilized. No one deserves a tragedy. The Hokier Nation embraces our own with open heart and hands to those who offer their hearts and minds. We are strong and brave and innocent and unafraid. We are better than we think, not quite what we want to be. We are alive to the imagination and the possibility we will continue to invent the future through our blood and tears, through all this sadness. We will prevail, we will prevail. Johnny Hart, the creator and author of the popular comic strip "B.C.," died on Saturday from a stroke. He was apparently at his drawing board doing what he loved to do the most when he died. 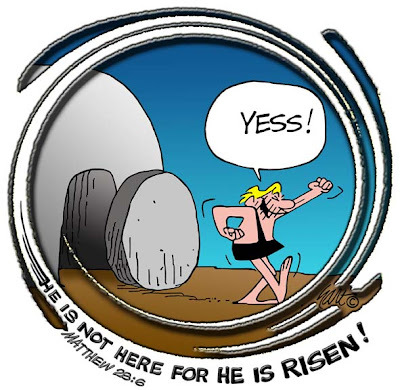 I find it ironic that it is right around this season of Easter that Hart died, as he was an unapologetic Christian and often wove his faith into his work. Appropriately, the above B.C. comic strip is a tribute to Johnny Hart.